SPORTS REPORTING&apos;S BEST ... AND WORST. Deadspin&apos;s revelation that the girlfriend of Notre Dame flinebacker Manti Te&apos;o didn&apos;t die -- and, in fact, never lived -- is the result of reporting "better than almost anything you’ll see on any media site," according to Sports Media Guy Brian Moritz. But he says it shines a spotlight on the worst of others&apos; work. * Which news organizations swallowed the hoax? The Chicago Tribune and Sun-Times make a list compiled by SB Nation. * Notre Dame athletic director Jack Swarbrick calls it a "sophisticated hoax perpetrated for reasons we can&apos;t fully understand. 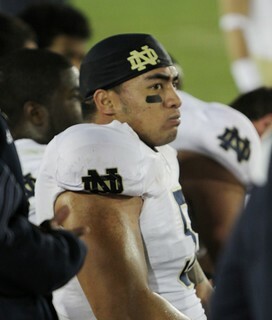 ... Manti was the victim." * John Kass: "Swarbrick is the same mealy-mouthed bureaucrat who defended the football program after student videographer Declan Sullivan ... was sent into that scissor lift in the high wind and died when it collapsed in October 2010." * CNN: Dead girlfriend tweeted last night. &apos;HOW SHAMELESS DO YOU HAVE TO BE TO DO THAT?&apos; Politico&apos;s Roger Simon (member of the Illini Media Alumni Hall of Fame) poses that question to the NRA for its video "twisting the Secret Service protection of the president’s children to aid those who make a fortune by manufacturing and selling guns." * Jon Stewart on "The Daily Show": 10 years ago, NRA-allied representative passed law that limited the government&apos;s ability to do what the NRA now says it wants the government to do. * Republican Party chair calls Obama&apos;s plan -- the biggest gun-control push in generations -- an "executive power grab." * Cook County gun reporting law wins board president&apos;s backing. HIGH EXPECATIONS ... LOWERED. Although aldermen who backed decriminalizing marijuana possession in Chicago predicted the city could take in as much as $7 million dollars a year from tickets, a WBEZ investigation finds the take since the change took effect in August more like $98,000. Bonus: Map shows 2012 pot arrests and tickets issued. WHO WANTS TO BE AN ALDERMAN? Mayor Emanuel says he&apos;s taking online applications to replace Sandi Jackson. * But privately, Jackson says she&apos;s picking her own replacement. FREE CALLS, COURTESY OF FACEBOOK. As of this week, Facebook&apos;s Messenger app for iPhone has acquired a button that lets you call other Messenger app users free over Wi-Fi and cellular networks. * Metra set to experiment with Wi-Fi on commuter trains. DIG THIS. Construction projects can reveal archaeological keys to Chicago&apos;s past. 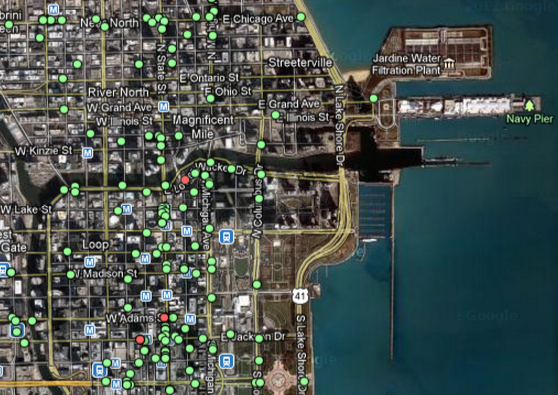 A WBEZ Curious City report reveals some of what&apos;s turned up. A FRACKING BRIGHT LIGHT. NPR&apos;s Robert Krulwich examines a phenomenon that makes the North Dakota skies rival the Aurora Borealis. * Study up. Tomorrow brings WBEZ Meyerson News Quiz No. 2. Last week&apos;s is here. * Soundtrack for preparation of this edition: All Over The World: The Very Best Of ELO on Rdio.com.